Hello friends! Two quick things today. First, I made some no-churn orange cardamom pumpkin ice cream for you. Second, you’ll want some sauce to go with it. 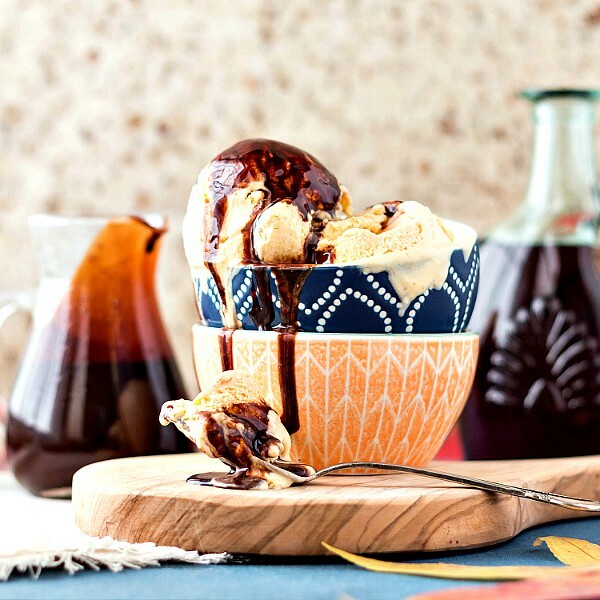 Fortunately for you, I guest posted over on my friend Jane’s blog, The Heritage Cook, and she is sharing both the ice cream and the sauce recipes over there. Go visit, and if you don’t know Jane, you will soon love her. As a bonus, her blog is gluten-free and is a wonderful resource for people who must avoid gluten but who still want to eat delicious food. She also has a Gluten-Free Bread Machine Cookbook–her first!–coming out in December. I encourage you to follow this affiliate link to go check it out and pre-order if you or someone you know is gluten-free and is really missing bread. I trust Jane’s expertise, and you will too. This is what I call a “transitional ice cream.” Even though it’s technically fall and I should be cozying up with allspice, cinnamon and nutmeg, it’s still pretty warm here in North Carolina. So my ice cream of choice combines fall pumpkin with bright, sunny orange and cardamom. I think you’re really going to love it. And don’t forget to visit The Heritage Cook to get the recipe for the Maple Chocolate Sauce as well. The two together are pretty magical! Here’s a long pin for you to remind you that both go together. 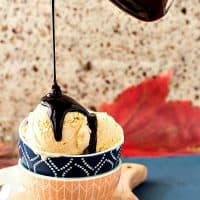 But I won’t tell if you just want to make the chocolate sauce, or decide to pair a different sauce with the orange cardamom pumpkin ice cream. 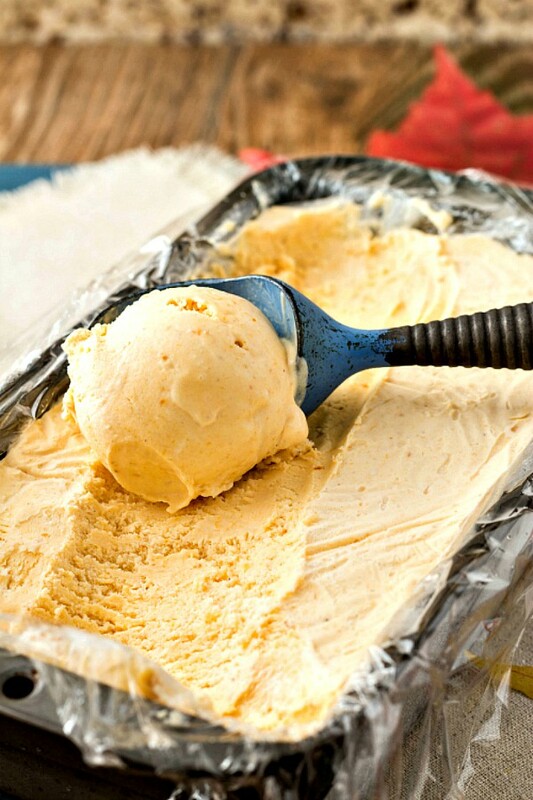 No-Churn orange cardamom pumpkin ice cream is the perfect ice cream to help you transition from summer to fall. Whip the cream, sweetened condensed milk, vanilla, salt, cardamom, and orange oil or zest together until thickened and whisk leaves tracks. You're looking for the consistency of boxed cake mix batter or thick melted ice cream. Thoroughly whisk in pumpkin by hand. Pour into a freezer-safe container, and press plastic wrap on the surface of the ice cream. Freeze until firm, at least 4 to 6 hours. To serve, allow the ice cream to temper in the fridge for about 20 minutes before scooping and serving. 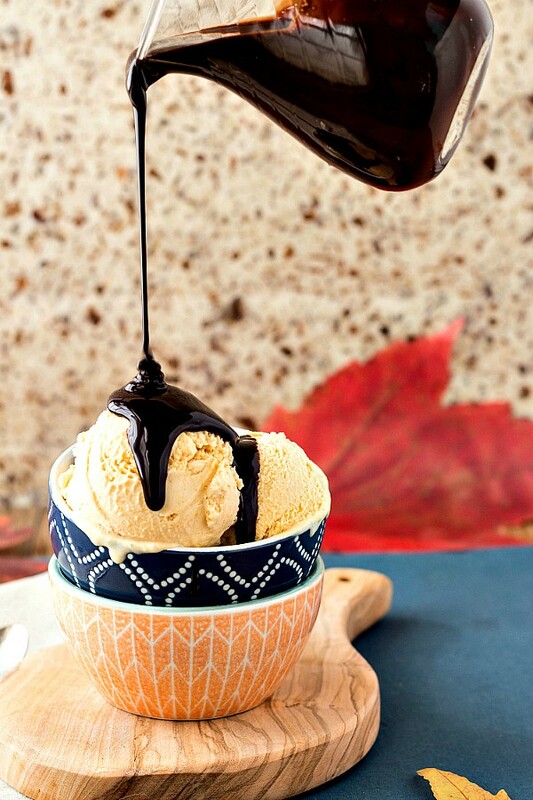 Please head over to Jane’s place to grab the recipe for the maple chocolate syrup. Good stuff, friends! Thank you for spending some time with me today, for supporting The Heritage Cook, and for being all-around good eggs. I appreciate you all very much. It’s never too cold for ice cream. That’s my philosophy. Can I have some,please?